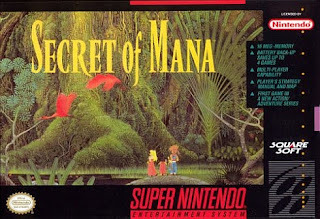 Secret of Mana is an Action-RPG that plays a little like the older Zelda games with less puzzle solving and more hack 'n' slash and leveling. You start off as a boy who finds a magical sword and, in doing so, gets himself perma-banned from his village. From there you end up on a quest to find out why so many monsters have appeared and, along the way, get a girl and a goofy looking dwarf thing to join your party and fight alongside you. Once you do, however, you can have one or two friends join in and control those characters, making for some long nights of multiplayer RPG goodness. 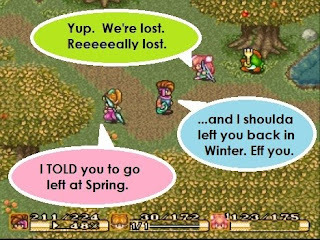 My fond memories of the game span multiple friendships. Sleepovers in junior high. A couple times soloing the game in high school. Playing with a buddy in college. Getting my girlfriend and her roommate to play. And someone always got stuck "on girl duty" as she was the healer. I don't think I ever actually beat the game in multiplayer, come to think of it, but it's something that will happen someday. Anyone looking to play the game these days can find it on the Wii's Virtual Console for 800 Wii Points, which really is a steal for that game. It's a great game by yourself, but add a couple friends in that are willing to spend some time with the game and you have yourself more than a few nights of fun in front of you. As for me, I've had the game on my Wii since the day it was available and all this talking about it makes me want to play it. Maybe I'll start it up with a couple friends again and see if we can't beat the game before the end of summer. Oh you know I'm ALWAYS down for some Secret of Mana.